This fall after I put my garden to bed for the year, I decided to organize my seeds. I have lots of seeds, some I bought and many others that I saved from my own plants. I am always getting confused as to what I have vs. what I need, so I really needed to straighten this mess out! My usual method had the seed packets in individual small bins. I always separated them into 3 categories: flowers, herbs and edibles. 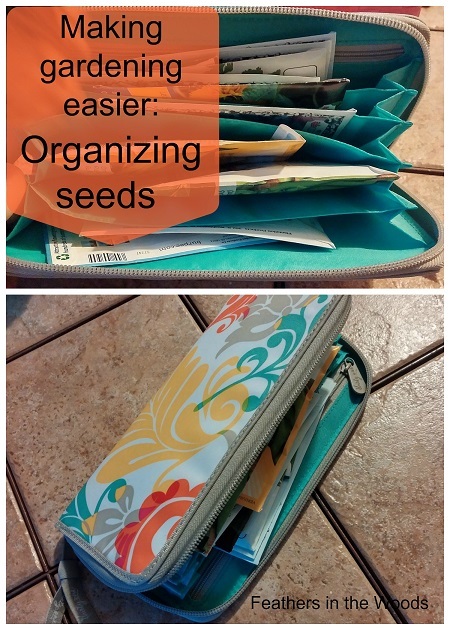 I've always used a 'seed wallet' when I go out into the garden to plant, but I needed more organization. So I decided to try the photo album idea that was so popular last spring. Now I have 2 types of organization going on and I think it's going to work better then ever! Let's start with my daily 'seed wallet' first. Every time I head out to the garden to plant, I take what I call my 'seed wallet'. It's really just a coupon clutch. It works great to hold the seed packets that I'm planning on using that day. It keeps the packets separated and dry and I can just zip it closed and throw it in my gardening basket. It works great. 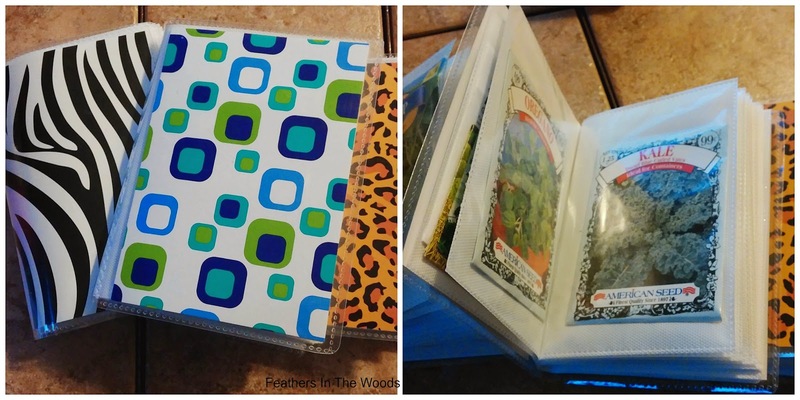 Originally I used one of those cheap plastic coupon clutches from a dollar store. My old one finally fell apart after about 6 years, so last year I got a brand new one with a zipper. That takes care of keeping the seeds straight when I'm actually using them. What about storage though? This is where that photo album idea came in. I bought 3 different mini photo albums from the dollar store. I used 1 for each of my 3 types of seeds. All I did was put a different seed type in each picture sleeve. If I had more then 1 packet, I put them in the same sleeve with the oldest one on top. Hopefully that will keep me using them in order! This worked for everything but the largest seeds. Peas, beans and corn ended up staying in their original bin. They were just too wide for the albums! This weekend I pulled everything out to get some flowering plants started early. I was happy to see that everything was still organized unlike those bins that would sometimes get knocked over. I easily found my lavender, chamomile and basil so I could start the seeds. Normally I don't start seeds quite this early, but these are my favorites and I keep them in the house as long as possible. I can't wait for them to start growing! Oh my goodness..how exciting! We bought this place almost 6 years ago and I still remember standing in the huge yard, looking at a tiny garden and thinking "this is gonna be huge when I'm done with it!" lol You're gonna have so much fun! This is a great method for sorting seeds! Thanks so much for linking up to Awesome Life Friday! We'll be pinning this - we're looking forward to seeing what you have to share this week! Thanks so much! I'll stop by and see you this week too! Those are great ideas! I unfortunately do not have much of a green thumb. Tried a garden one year and got some stuff. I was so proud of that first radish! LOL All of my friends here have small gardens that did pretty well last year. I was thinking about doing a garden this year, but will probably be going to visit my family for in FL for 3 weeks and doubt that my hubby will want to be burdened with another one of "my gardens". And you're right! We are pretty close. Boy did we get blasted with more snow yesterday! The first radish is exciting! I get that way about tomatoes every year. I just love them fresh! The snow and cold has been unbearable! I'm dreaming of summer......I bet you can't wait to get to Florida! Thanks so much for the share! I'll stop by and link up again this week! I'll stop by to link up again this week! I just picked up an old record box at a thrift for $1. I thought it would work nicely to hold my envelopes of seeds. Can't wait to start gardening! Thanks for sharing with SYC. Great idea Jan! I use an old "Bare Minerals" box to keep all of them in. Some of those cardboard boxes are really sturdy!